The views are out of this world. The waters glisten with a muted palette of blues; the islands dazzle with a patchwork of rusts and greens. Surreal stone ridges and huge vertical upthrusts of solid rock run along the southern shore. To the north, a wall of clouds breaks to reveal the snow-covered peaks of the Cordillera Real. It feels like the setting in a National Geographic dream. 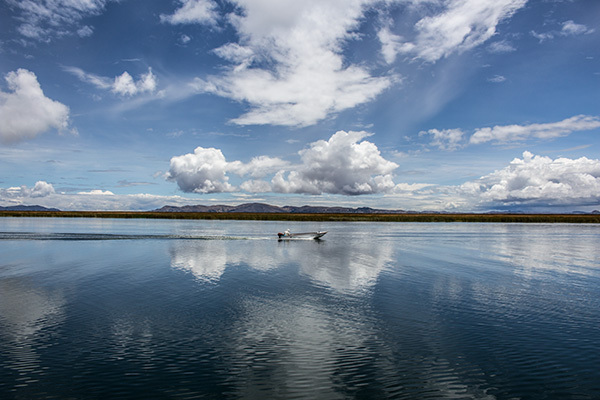 Ahead of us, our destination floats on the surface of Titicaca. 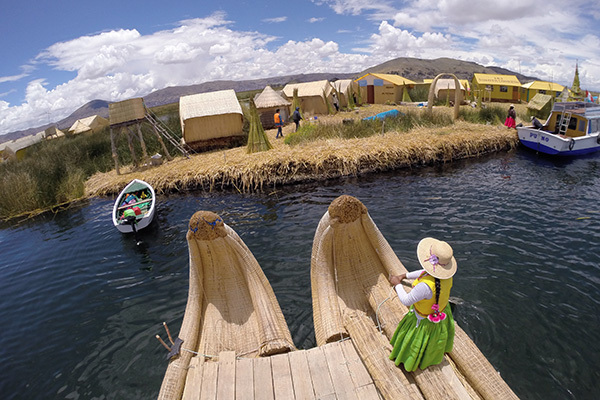 It’s the man-made reed islands of Uros, one of the strangest UNESCO World Heritage Sites on the planet. Located along the border of Peru and Bolivia, extraordinary Lake Titicaca sits at a staggering elevation of 3,812 meters (12,507 ft). To put that into perspective, that’s higher than Lhasa in Tibet. As in Lhasa, there’s an air of mystery and magic that swirls around the region, adding a certain mystique to its landscapes and peoples. 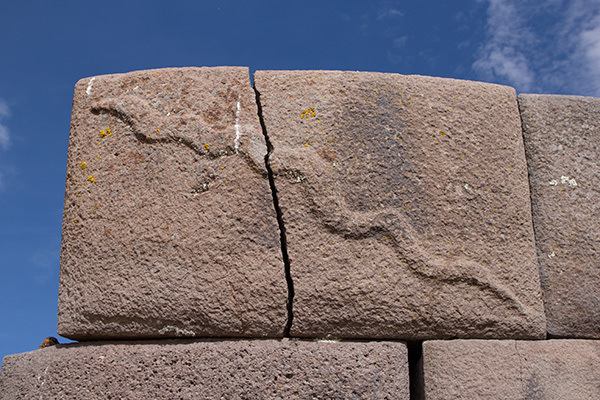 Some have even suggested that the islands in Titicaca are the source of the legend of Atlantis. And while Atlantis remains nowhere to be seen, there are plenty of natural and cultural attractions to keep adventure lovers happy for quite some time. 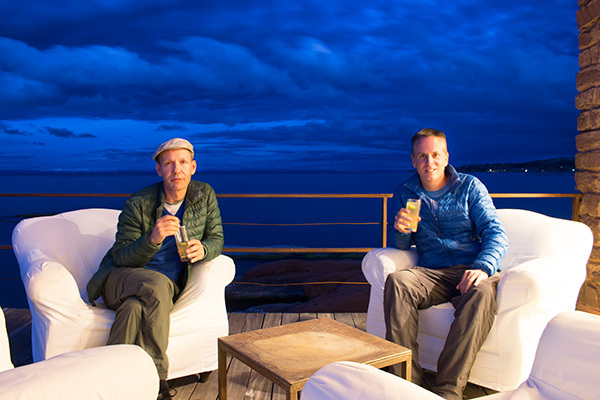 We have come to discover the best of those attractions with Titilaka, an all-inclusive hotel for luxury adventurers situated on the shores of Titicaca an hour south of Puno. Titilaka is arguably the most luxurious accommodation on the lake, but with only 18 rooms, the boutique hotel remains small, very personal and utterly serene. Everything about Titilaka is world-class, the gorgeous setting, the service, the gourmet food, the stellar rooms, and their tailored excursions. 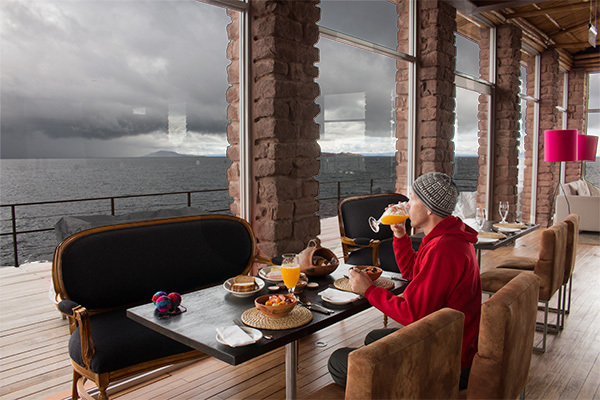 For globe-trotting adventurers, the luxury hotel becomes a part of the Titicaca experience blending exceptional accommodation and fine dining with a series of adventurous explorations of the surrounding region. We step off of the Titilaka boat onto the floating island of compressed reeds. It’s a strange sensation as the reeds crack and give under my feet; I almost feel like I am damaging something and that I should turn to my hosts and apologize. The island itself is remarkably stable, I guess I expected it to feel like I was walking on a water bed. The history of these floating islands is a story of survival. 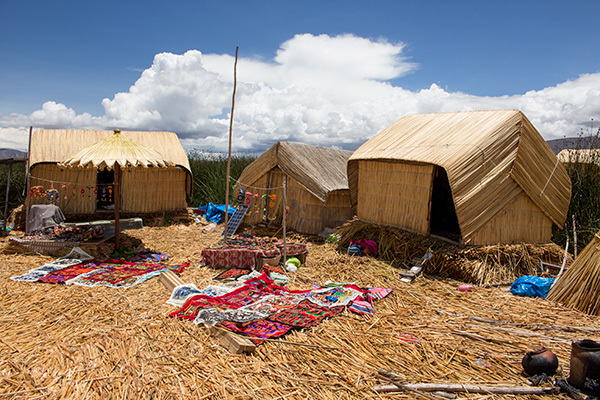 The people of Uros have been on the move for centuries. Once a jungle tribe, they have been forced to relocate over and over. 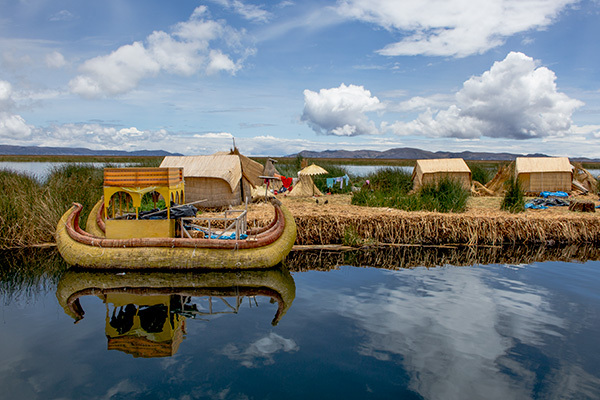 Persecution and abuse at the hands of several cultures led them to take refuge in the vast reed wetlands of Titicaca. Over time, they learned how to manipulate those reeds to create boats and later floating nests. Through trial and error, the tribe of reed people learned to build entire islands. After their discovery, there was a new invasion of curious onlookers. Today, that onslaught is strictly managed by the people of Uros. Upon arrival, tourist boats are each directed to a separate island to help disperse tourist dollars. As there are more than 60 islands, that also helps prevent tourist overload. We sit with Felix, Dina, Magdalena and little Rozio on their island and, through Armando, discuss life among the reeds. There is something especially dramatic about the sound of the Aymara language. Felix explains how the islands are built as Dina demonstrates with loose reeds. It’s a huge amount of work to maintain their water world and living conditions are basic. Houses are simple one-room reed huts. Although small solar panels bring a few conveniences in the 21st century, there is still a great temptation to move to the city, especially for young people. Despite those temptations, the number of people on the islands is actually increasing. 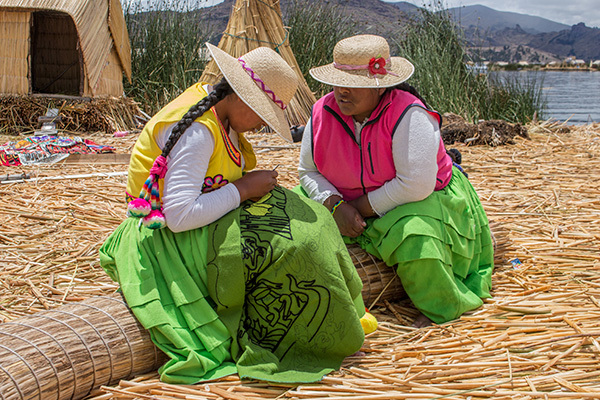 For obvious reasons, earning potential is quite limited in the Uros islands. Since Thomas and I don’t generally buy souvenirs, when Felix and Dina offer to give us a ride in their elaborate reed boat for a small fee, we accept. They paddle us across the channel to look at the local kindergarten as well as a small museum, both largely made of reeds. There are children peeking out of the windows at us as we photograph the kindergarten playground. The Titilaka boat arrives to pick us up, and we leave one of the most unique places I’ve ever seen. 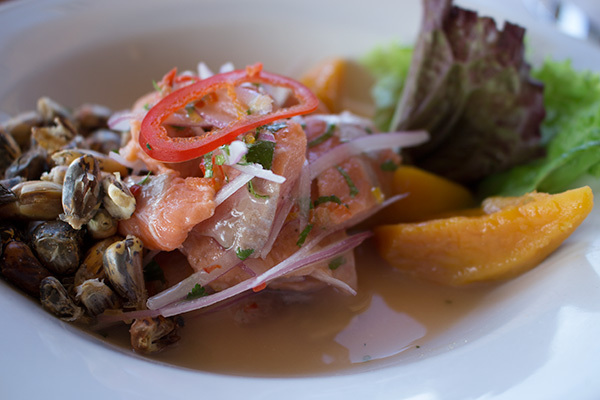 Titilaka’s menu is one of the highlights of my trip to Peru. I can’t decide what to eat: duck confit with Peruvian cilantro rice, sous vide pancetta with glazed sweet potato puree, wheat risotto with artichokes – it all sounds so fantastic. The waiter refills my champagne while I scratch my head in confusion. Thomas looks like he knows exactly what he wants. As our readers may have figured out by now, he is very decisive when it comes to food. One of the strokes of genius at Titilaka is that you pay for your stay, and that’s it. It’s not cheap, but you know exactly what you’re paying before you get here. 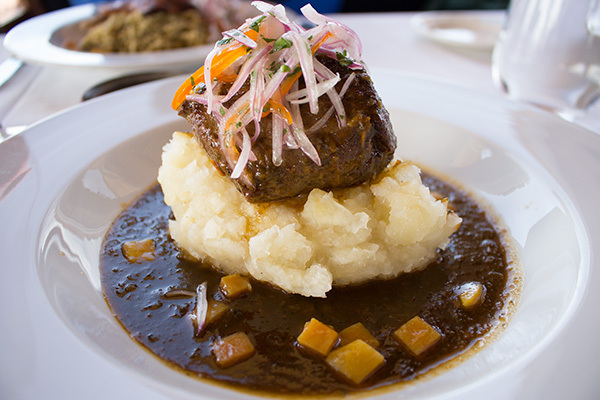 Food, alcohol and excursions, such as the one to Uros, are all included. There are a couple of small exceptions like an extended day trip to Tiahuanaco in Bolivia, but basically, once you are here, you don’t have to think about money at all. I take another sip of my champagne and glance out through the wall of windows at the stars roughly reflected in the lake. Moonlit swells move across the surface and break on the rocks. “May I take your order?” asks the waiter. Uh oh, I could really get used to this. “You can see them on the hill, straight ahead,” says Armando. I position myself better to see out the windshield; my view is momentarily blocked by a girl leading an alpaca across the road. She passes, and the famous chullpas of Sillustani come into view. 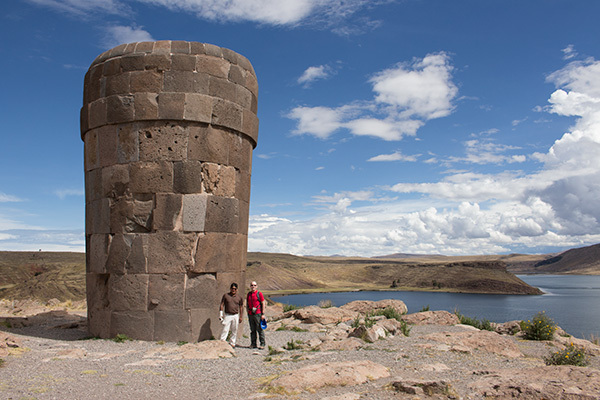 There are literally hundreds of stone funerary towers scattered across the Altiplano in both Peru and Bolivia, but the Inca chullpas of Sillustani are the most famous because of their size and the quality of their stonework. We park the car at the base of the hill and begin the short climb up to the famous towers. Along the path we discover a series of shorter, more crudely-made Colla chullpas. 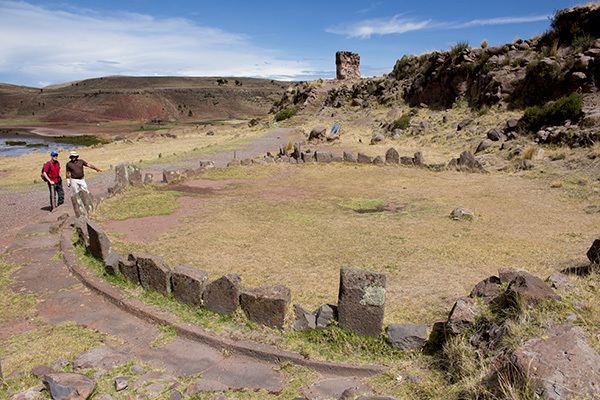 Armando explains that the Incas did not traditionally build funerary towers, but when they occupied the Aymara-speaking Colla people, they took up the tradition. The view from the top is spectacular. 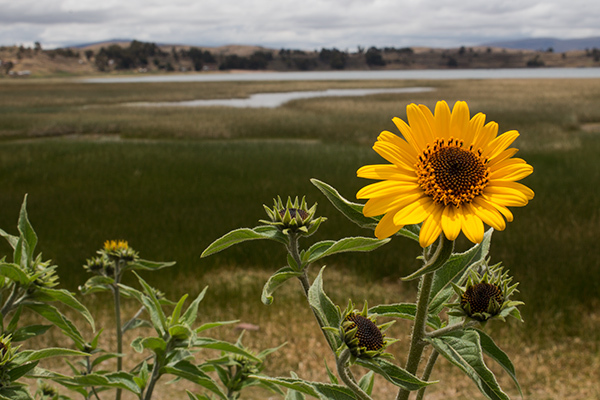 Two of the best surviving towers overlook gorgeous Umayo Lake. Since it’s late in the season, we have the archaeological site largely to ourselves. We pose for pictures and examine the incredible stonework on the Inca towers. We hunt for a few mysterious carvings including a famous lizard which is required viewing. The towers are impressive, but it’s their location and the surrounding landscape which creates a real sense of magic. We pause to just take it all in. “How was your day? Did you enjoy Uros and the towers?” asks Virginia at the front desk. “Spectacular!” we both answer in unison, thrilled that the weather gods are blessing us with rainy-season sunshine. “It’s happy hour if you like some drinks,” offers Virginia. I’m a bit perplexed at the concept of “happy hour” when drinks are free at all hours and we even have wine and champagne in the room. But hey, why not? Maybe Titilaka just likes a dedicated drinking hour where you can relax on the deck and stare out at their remarkable views. I can also use a drink after the whole vase fiasco. I order a Baileys and Thomas orders a mango sour. Dramatic, black clouds have gathered over the Isla Taquile in the distance. The play of light off the clouds has turned the rocks in front of the hotel purple. It looks like a sea monster rising out of the lake. The crossing to Taquile Island is a bit rougher than I expected. I thank the mountain gods for that precautionary Dramamine that Thomas gave me before we stepped onto the boat. The island ahead is stunning, a vibrant checkerboard of reds and greens. The entire island has been sculpted through centuries of terracing. We step off the boat and walk up the trail towards a collection of surprisingly nice houses. 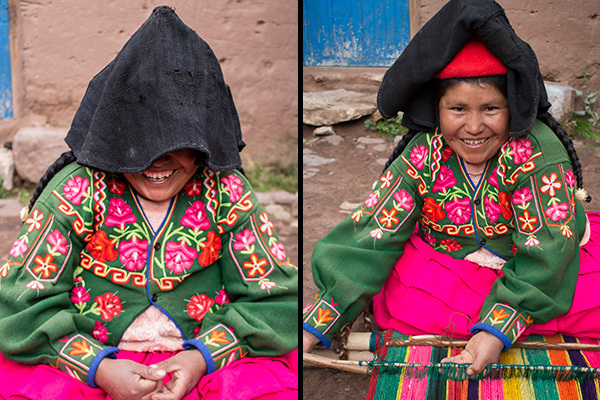 The Quechua-speaking inhabitants of Taquile dress very differently from the Aymara speakers on the mainland. Their clothing is a fascinating blend of Spanish, Moorish and Andean influences. Armando explains that the clothing is even more extraordinary than first glance would suggest. 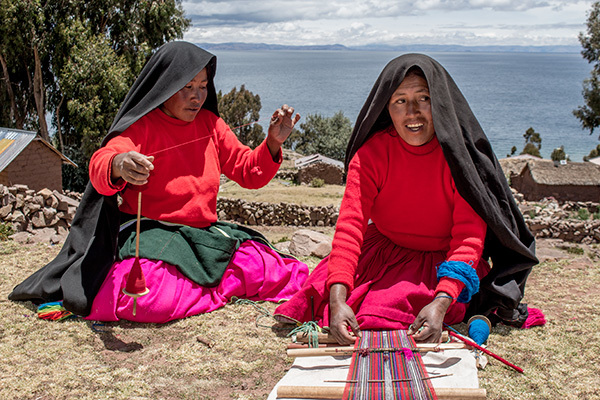 We sit next to a group of locals weaving and knitting in a yard overlooking the lake. Armando picks up a woven belt and points to the staggeringly tight weave. Thomas and I have seen traditional weavers across the globe from Ethiopia to Cambodia to Guatemala, so I initially mistake it for a machine-made piece – but it isn’t. 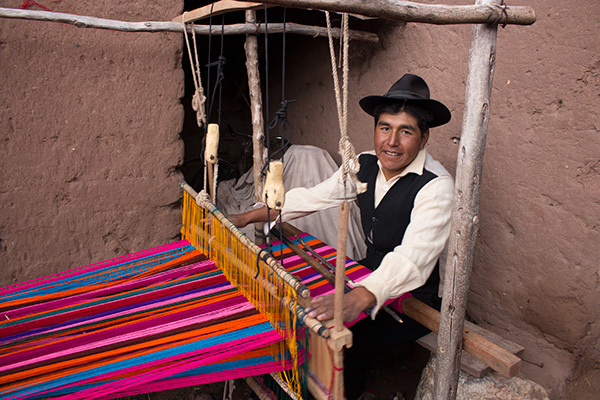 Armando explains that Taquileño weaving is of such high quality that UNESCO has designated it a Masterpiece of the Oral and Intangible Heritage of Humanity. To prove that grandiose title is justified, Armando picks up a traditional Andean hat and pours water on it. The water rolls off onto the ground. 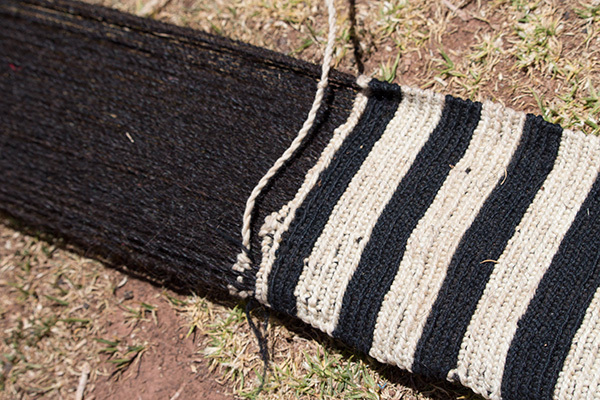 I acknowledge that the weaving is incredible, but I am wrong – the hat has not been woven, it has been knitted. I am stunned. In all our travels, I have never seen anything like it. He explains that on Taquile the art of knitting is reserved for men only. But Armando is not done blowing my mind yet. He explains how hopes, dreams, and values are woven into the items. Birds representing happy couples, churches and traditional temples representing devotion to their blend of faiths, representations of future houses and boats. As I photograph the pieces, a little girl named Mariza Erica watches my camera. I turn and take a picture of her. I hold it out for her to see. She puts her little fingers on the screen and starts scrolling through the pictures until she finds a video. She hits play, rewinds, skips ahead and then returns to the home screen. She flips through the pictures again until she finds a picture of herself. She zooms in and laughs. I am floored that she can navigate my camera better than I can. Thomas looks like Obi-Wan Kenobi in the sleek black robe Titilaka provides for its guests. He’s filling the bathtub and staring out at the beautiful wetlands scanning for birds. While the tub is filling he spots cormorants, moor hens, and Andean ducks. I walk into the bedroom and plop down on the king-size bed. As I sink into the pristine, snow-white duvet, Thomas announces that he has just spotted black ibis. I move over to the sitting area by the window and scan the reeds for the birds. We’ve just spent the afternoon in a rowboat exploring the wetlands but I can’t get enough of the views. “Would you like some wine?” I ask Thomas. I already know the answer, so I open a bottle of Malbec from the minibar and pour us both a glass. Again, it’s great to not even consider the cost. Everything in the minibar is included. I grab a chocolate bar and return to the window for more views and birdwatching. Our room just might be the most luxurious wildlife hide ever! 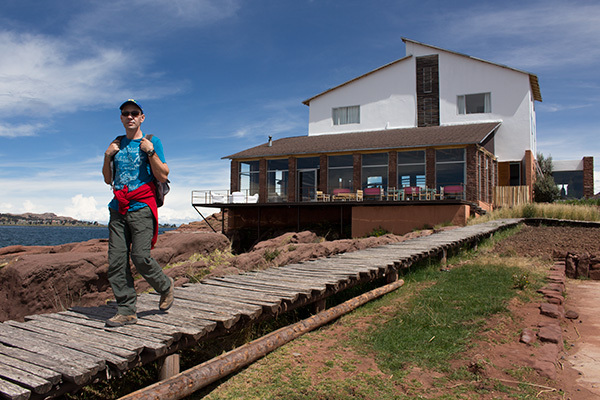 We are exploring the epic landscapes along the southern coast of Titicaca. It’s a stunning region where farms look like magnificent works of abstract art. There are so many things to see and do in the area, you could literally spend days driving the back roads connecting the attraction dots. There are the late Inca chullpas of Molloco, where we discover that someone has been practicing black magic. They have sacrificed a black chicken at one of the funerary towers in an attempt to magically murder someone. The find visibly disturbs our guide Armando. Thomas and I secretly snap photos. 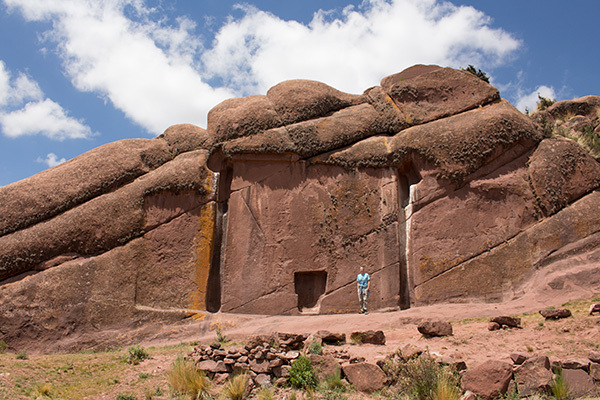 There is the spectacular Amaru Meru portal, a mysterious door carved into solid rock. Nobody knows who carved it and why. 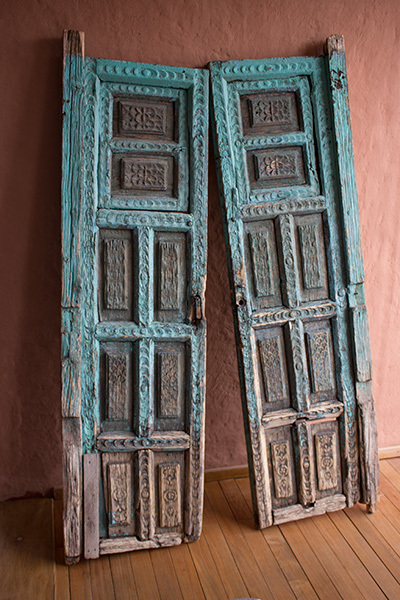 The door leads nowhere, but new age mystics think it is the entrance to another realm. We hike up into the uplifted red rock for views over the lake. Our driver takes us over a mountain via rough, pot-holed roads. The adobe villages along the way become more traditional the further we drive. 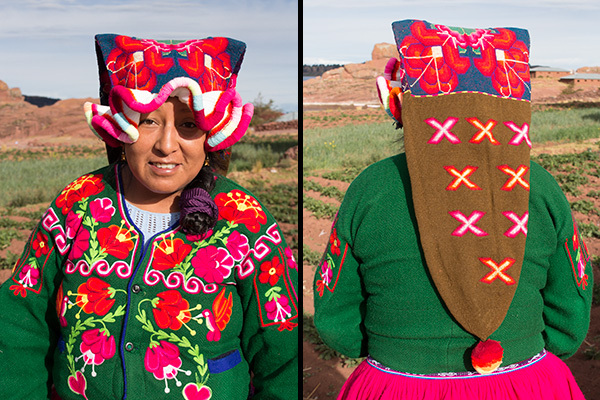 Most of the people along the road are wearing beautiful Aymara clothing. 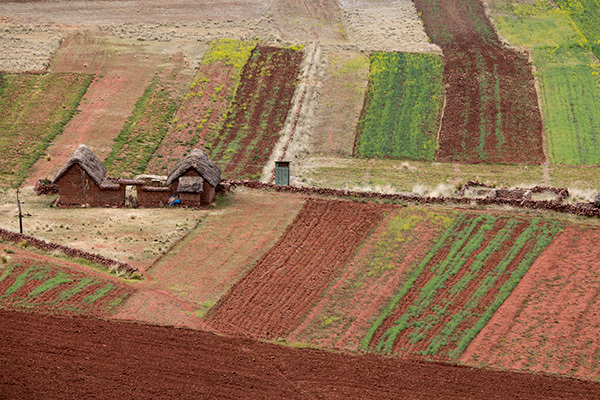 The views over the technicolor farmscape give way to a vast wetlands and Titicaca beyond. 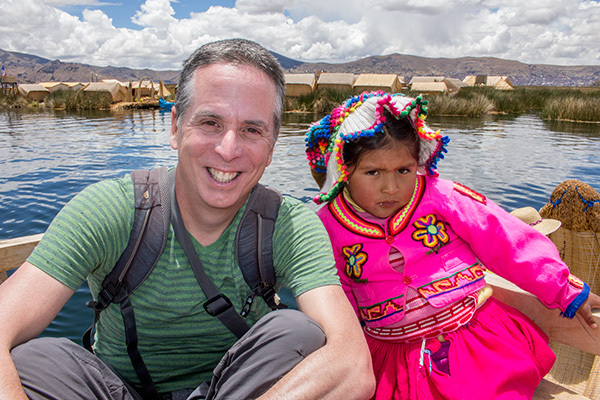 We descend to the isolated village of Copamaya to visit a family of weavers. We enter their courtyard to discover them hard at work. Celadonio is in the corner working his freestanding loom. His wife Asunta sits next to him weaving on a backstrap loom. Their hands move on autopilot while they greet us. Celadonio’s sister Ofelia is leaning against the wall spinning alpaca wool into thread. Daughter Elena is near the entrance knitting. Armando explains this is the family that has produced the textiles in Titilaka. He translates our questions into Aymara. Asunta is married, but she is not wearing one of the undersized bowlers or top hats that most married women wear today. 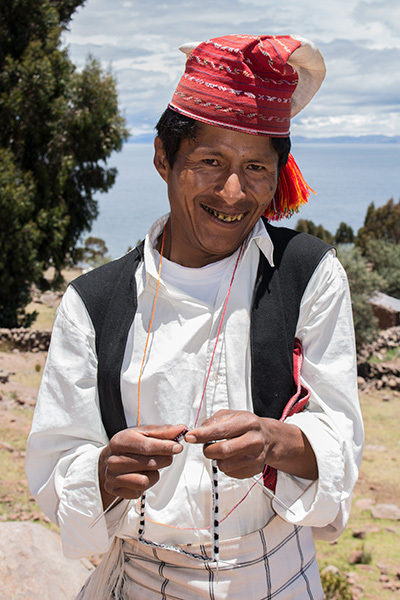 Armando explains that this is what was traditionally worn by the Aymara of Copamaya before newer hats came into fashion. Asunta offers to show me how the women wear their hats when they are working in the harsh sun. She flops the hat down over her entire face; all I can see is her smile. She bursts into laughter at her own comic genius. I love Titicaca. 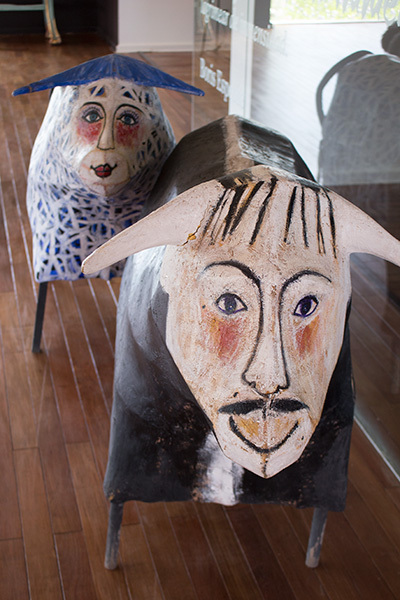 If you would like to find out more about Titilaka, their excursions and their rooms, visit them at www.titilaka.com. 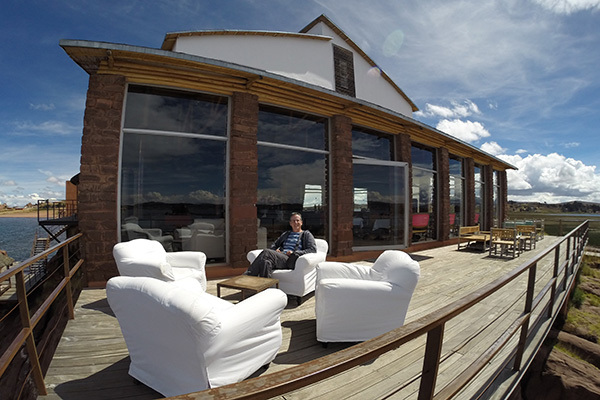 Disclosure: We were guests of Titilaka during our stay at Lake Titicaca. However, all of the opinions expressed here are our own. 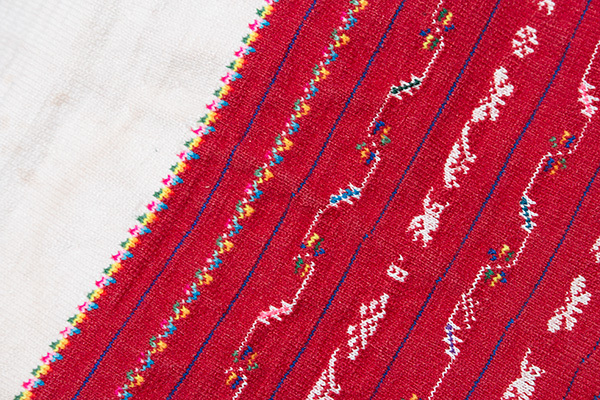 Aren’t Peruvian clothes beautiful? I really appreciate the pictures of the fabric. The island weavers sound like a place I need to visit. You two really live the good life. The hotel sounds like a dream come true. There are a lot of words of superlatives I can say about Lake Titicaca, Uros, the Aymaras, and Titilaka based on this post alone. But I surely hope that such unique culture and well-preserved ancient structures will survive not just decades, but centuries even millennia to come. You guys are making me crazy. Every post adds two or three new things I have to see. I have never even heard of Amaru Muru. It looks a bit like something in Petra. 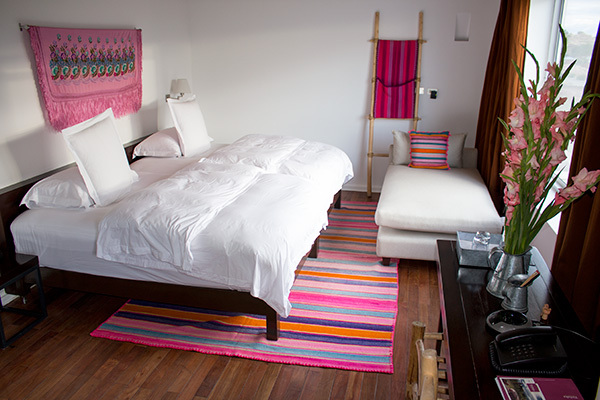 Do you feel you are getting an authentic Titicaca experience in such a luxurious hotel? Absolutely. Actually, one of the great aspects of Titilaka is how they organize their excursions. 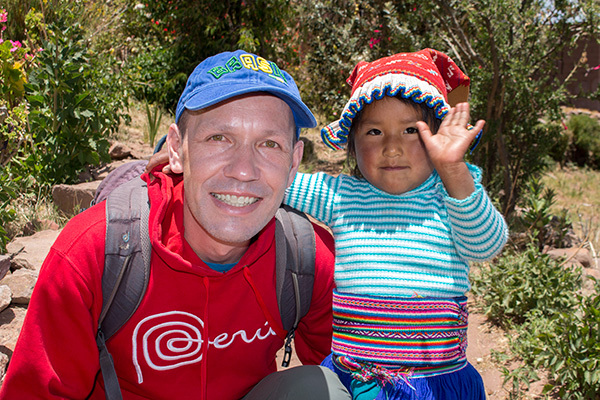 Many of their trips such as their Aymara Road option take in really off-the-beaten track rural locations with visits to local families. 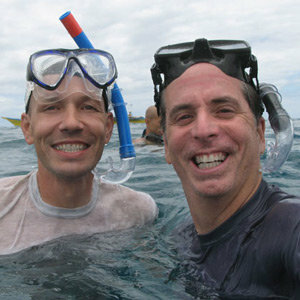 Even their Isla Taquile trip visits the far side of the island away from most day trippers. They also have some really interesting new trips they are developing for 2015 taking remote wetlands areas and options for extended day hikes along isolated stretches of rural countryside. We loved the way they organize and personalize their day trips. Fantastic. These pictures make me want to go right now. The cleaning lady’s hat is unbelievable. I can easily understand why you would hang around trying to get a picture of her. But, her hat and her clothes look brand new. Is that the normal dress for the area or is it something special for the hotel? That is really the way the women dress. That’s the typical hat of an unmarried woman. Married women wear different hats. You mention that her clothes look especially clean. It’s true that she has to dress nice because she works in a luxury hotel. But to be honest, we saw a lot of women with perfectly clean clothes walking around the villages or on their way to school. I think they just really take pride in the way they look. Super video. Makes me want to go right now. Where are those beautiful red mountains? 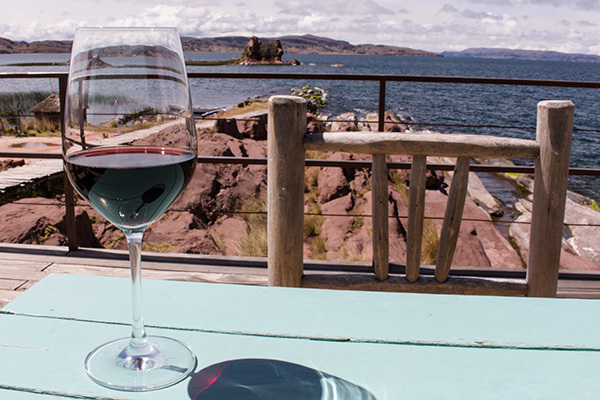 @Max, There are stunning red rocky outcroppings running down the south coast of Titicaca. There are beautiful stretches near the Titilaka hotel, which we mention in the post. There is also a stunning little circular hike up into the rocks behind Amaru Meru. This makes me want to go right now. We are planning to visit Peru this summer and we are trying to put together our itinerary. The problem is that the country seems to have so many must-see destinations. Clearly, we have to put Titicaca on the list. Do you have any other recommendations? This is a must do experience for me. Remember the scene where Prince (in the film Purple Rain) tricked his lover to swim in a non-de-script lake for good luck, in the belief she thought it was Lake Titicaca 🙂 Classic!